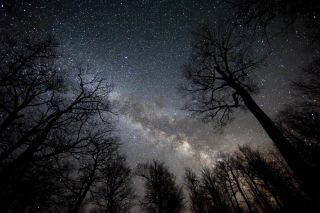 Skywatcher Shawn Malone sent in this photo of the Milky Way taken during the weekend of April 28-29, 2012, from the shore of Lake Superior. She writes: "The Milky Way was eye poppingly bright." With the bright moon out of our evening sky this week, it's a great time to get away from city lights and explore the beautiful summer Milky Way. But 35 years ago today, even New Yorkers got a glimpse of our home galaxy. Today (July 13) marks the 35th anniversary of a night that I will always remember. At 9:29 p.m. EDT, lightning from a severe thunderstorm struck a power plant at Indian Point, New York. The result was sudden power failure that plunged all of New York City into darkness. I was living in the Throggs Neck section of The Bronx at the time and ended up spending the entire night observing with my 4 1/4-inch reflecting telescope. "By 11:35 p.m. I could perceive the Milky Way through a scattered layer of clouds. The best view came after 2:15 a.m., when it stretched from Cassiopeia to northern Aquila, complete with dark rifts and the Cygnus Coal Sack. The 5.4-magnitude star 24 Vulpeculae was readily seen without binoculars, as was the Great Andromeda Galaxy, and viewed a host of deep-sky objects I would normally never attempt to look for from my home." This magical night ended with the thin crescent Moon, Jupiter, Venus, Mars and the orange star Aldebaran all lined up in the eastern sky at dawn, followed by a beautiful sunrise. My report would later appear in the September 1977 issue of "Sky & Telescope" magazine on page 252. The Milky Way holds several intriguing sky sights for stargazers to seek out. Several clouds of stars, surrounded by a few dark regions for contrast, can be seen with binoculars in the area of the Milky Way about halfway between the star Altair and the constellation of Sagittarius. Four faint stars in a stretched-out diamond are about all that is visible of the constellation Scutum, the Shield. The Shield was described as a constellation by Hevelius, a 17th century astronomer, who christened it with the fantastic moniker, Scutum Sobiesciarium in honor of John Sobieski, a Polish king who defeated the Turks at Vienna in 1683. Near the northern star of the Shield is M11, the 11th entry in Charles Messier’s famous catalogue of "fuzzy" objects masquerading as comets. Messier 11 is one of the richest and most compact of galactic clusters, described by one experienced observer as resembling "a flight of wild ducks." One of the Milky Way’s great star clouds is also within Scutum. Before the invention of the telescope, the true nature of the Milky Way galaxy ("gala" is Greek for milk) was a mystery. Binoculars and telescopes reveal that the galaxy consists of dense clouds of individual stars, such as the one in Scutum. For observers in the Northern Hemisphere, the brightest part of the Milky Way is in the constellation of Sagittarius, near the star El Nasl. In fact, this region is roughly our galaxy’s center. It marks the "hub" or central condensation; an area of density and complexity. Even to the unaided eye, the view is one of excitement and beauty. The Sagittarius Star Cloud, about 30,000 light-years distant, seems to be the nucleus, with the sun and all the outer stars of the galaxy revolving around it at the rate of 155 miles per second. It apparently requires about 200 million of our Earth years to make one complete revolution, or one "cosmic year," around the center of our galaxy. During the Great Blackout that darkened much of the northeast United States on Nov. 9, 1965, a brilliant moon just one day past full and lit up the night sky like a giant spotlight, only frustrating sky watchers by squelching the light of all but the brightest stars. You may also recall that on Aug. 14, 2003, the Northeast U.S. again experienced a major power outage, but I doubt that the view from my old stomping grounds would have matched that of what I experienced in 1977. That’s because in 2003 the weather was considerably hazier and the moon was again very bright … just two nights past full. So although the dazzling lights of New York were shut off three times between 1965 and 2003, a dark country sky only showed itself for a few precious hours on that very special night in 1977. I moved out of The Bronx in 1984. I lived there almost 20 years, but aside from that uniquely special July night in 1977, I never again saw the Milky Way from my house.